In the new Fortnite update, they released an Epic & Legendary Pump Shotgun, Team Rumble Limited Time Mode, and more. The new Epic and Legendary Pump Shotguns have been released. They can do 105 / 110 maximum damage and can be found from floor loot, chests, supply drops, and vending machines. Shotguns will now always apply at least 3 pellets worth of damage if only 1-2 pellets hit the target. Pump shotguns will do higher damage in shorter range buckets but damage falls off quicker. This means you’ll do more damage to closer targets but less damage to farther targets. Double Barrel Shotguns have been removed from floor loot. They released a limited time mode called Team Rumble. Two large teams fight for the Victory Royale in an action-packed mode where the first team to get 100 eliminations wins! This mode has two teams of 20 players. Players will respawn after 5 seconds when eliminated, keeping their inventory. Numerous bugs have been fixed in this update. For example, the issue with players not having an audio cue while gliding after respawning, and the issue with Chiller effects not applying properly to players’ feet. You can check out the link below for the full details on the Epic and Legendary Pump Shotguns, Team Team Rumble, and more. 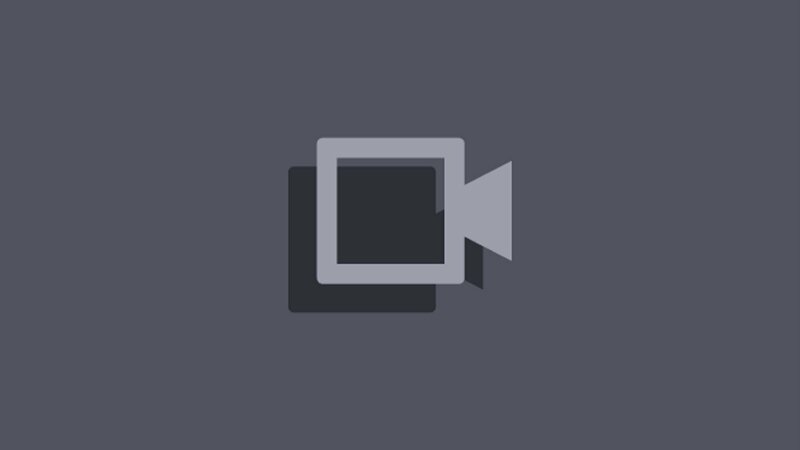 Last edited by Yehhp; 12-06-2018 at 12:31 PM. In the new Fortnite update, Season 7 arrives as the Iceberg collides with the island. There are a bunch of new areas to discover! New Season, means new Battle Pass. There are 100 levels, and over 100 new rewards. Give your weapons and vehicles a new look with Wraps. Level up your Battle Pass to unlock different Wraps, then equip them in your locker to items like vehicles, shotguns, rifles and more. Imagine, Build, and Battle like never before in the early release of Fortnite Creative! Battle Pass owners will have early access to their own Creative island for one week, then all players will receive islands on December 13, 2018. A new vehicle arrives in this update. The X-4 Stormwing Plane. It seats 4 passengers (on the wings) and a pilot. It has a mounted machine gun, but it can overheat. Players will go into the skydiving state when exiting the X-4 Stormwing. Balloons have been reworked so that while they are equipped, it is possible to use weapons and items. Players can attach up to 3 Balloons to their back, lifting off the ground when the 3rd Balloon is attached. A bunch of items have been vaulted in this update. Shadow Stones, Port-a-Fort, Chiller, Clinger, Double Barrel Shotgun, and Shockwave Grenade have been vaulted. A new Biome has been added to the map, called Iceberg. 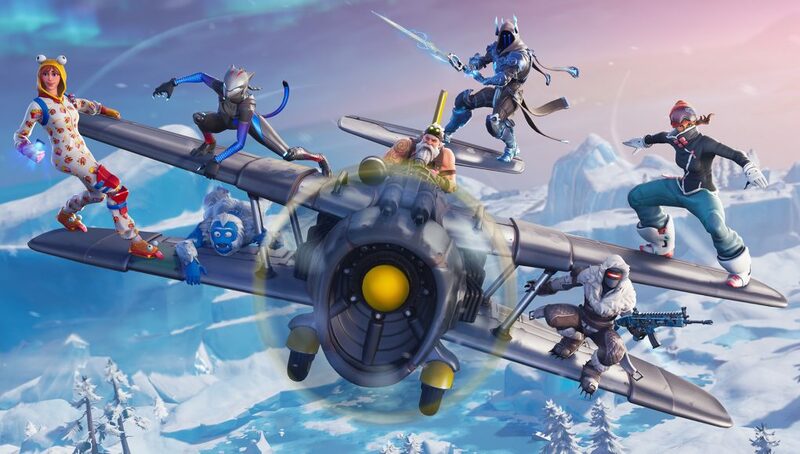 Along with that, there are three new locations called Frosty Flights, Polar Peak, and Happy Hamlet. Icy Surfaces can be found in snowy areas. Ziplines can be found around the Iceberg and near Expedition Outposts. You can check out the link below for the full details on the Season, X-4 Stormwing, new locations on the map, and more! In the new Fortnite update, they released a Supressed Sniper Rifle, brought back Dual Pistols, and more! The new Supressed Sniper Rifle is available in Epic and Legendary variants. Can be found from chests, floor loot, Vending Machines, and Supply Drops. The suppressor makes for a quieter shot, trading stealth for power. It deals 100/105 base damage. The Six Shooter has been vaulted, along with the uncommon, common and rare Burst Assault Rifle. The Dual Pistols have been unvaulted. Dynamite drop rate has been reduced by 40%. The Boombox drop rate has been reduced by 33%, health reduced to 400, and duration reduced to 18 seconds. 14 Days of Fortnite has been extended for a limited time! For the next week, drop in and complete any Challenges you may have missed out on to earn in-game rewards. 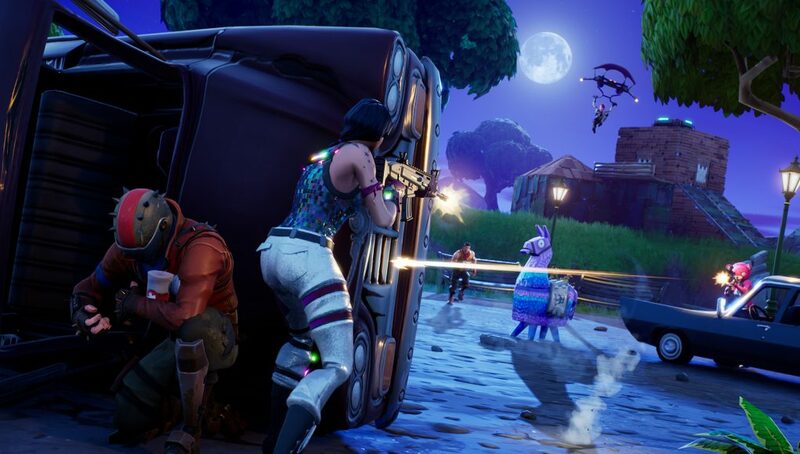 Fortnite will continue to feature some of the most popular Limited Time Modes that have been available over the past two weeks. Log in each day to find out which modes are available to play. You can check out the link below for the full details on the new Sniper Rifle, item adjustments, and more! In the new Fortnite update, they released a Scoped Revolver, brought back Glider Redeploy, and more! Don’t have a sniper? No worries. 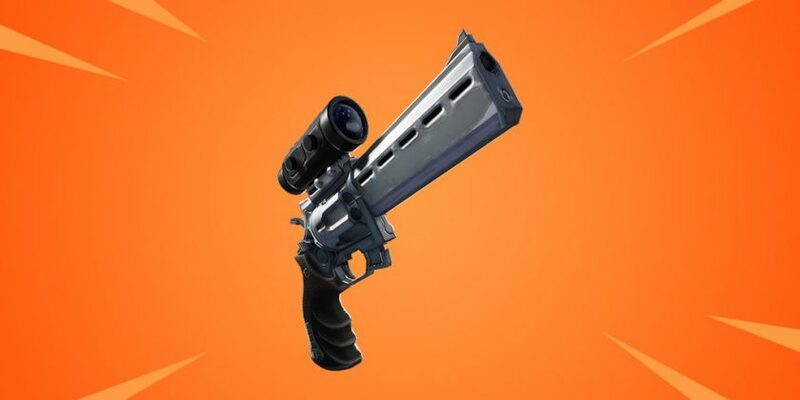 Use the new Scoped Revolver to hit precise shots against enemies. It’s available in Epic and Legendary variants. It fires medium ammo and does 42 / 44 damage per shot. It can be found from floor loot, chests, Supply Drops, and Vending Machines. They also released an item called Gliders. Which is a rare item that grants Glider redeploy. This item takes up an inventory slot and can be found from normal loot sources. Gliders do not need to be selected to deploy. Activate them by pressing your jump button while in mid-air. They come with 10 charges and each deploy uses a charge. When all charges are used the item disappears. There are some rarity adjustments that have been made in this update. Balloons have been changed from Epic to Rare, Stink Bomb changed from Epic to Rare, and Scoped AR decreased from Rare/Epic to Uncommon/Rare. Tournament systems have been significantly updated to support upcoming features. Epic will be operating a series of small scale test events as they test these updates with more players. They will be testing in waves until they are confident in the new functionality. At that point, Epic will again begin running tournaments regularly for all players. During events, players will be automatically removed from the match after 60 seconds of spectating after being eliminated. You can check out the link below for the full details on the new Scoped Revolver, Glider Redeploy item, and more! In the new Fortnite update, they released Sneaky Snowman, vaulted items, and more! Is that snowman closer than it was a second ago? Sneak around the map and surprise enemies in a new way. Sneaky Snowman is available in Common variant. It can be found from Floor Loot, Chests, Supply Llamas, and will drop in stacks of 5, with a max stack size of 10. Use Primary Fire to throw a projectile that creates a destructible snowman. Use Secondary Fire to wear the Sneaky Snowman. The Sneaky Snowman has 100 health and acts as a shield when worn by a player. 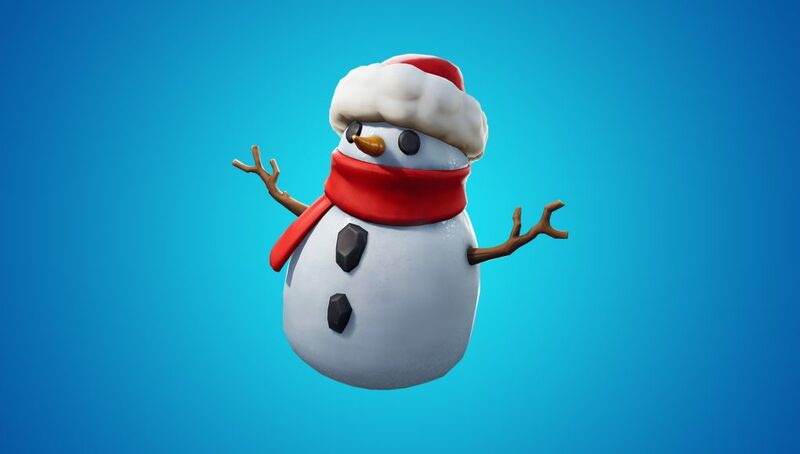 It will be destroyed when its health reaches zero or when the player wearing the snowman swaps to a different item or building mode. Epic has decided to vault some items in this update. The Quad Rocket Launcher, Port-A-fortress, and Grappler have been vaulted. They reduced the drop chance of some items. Shield Potion drop chance changed for Floor Loot from 16.53% to 13.22% and Chests from 14.26% to 9.51%. Small Shield Potion drop chance increased for Floor Loot from 13.22% to 16.53% and Chests from 9.51% to 14.26%. They also reduced the drop chance of Gliders, Balloons, Quad Crasher, and X-4 Stormwings. You can check out the link below for the full details on the new Sneaky Snowman, changes in drop chances, and more! In the new Fortnite update, they released a Infantry Rifle, #ShareTheLove surprise, new LTM, adjustments to gameplay and more! Take aim and deliver accurate fire downrange with this precise semi-automatic weapon. 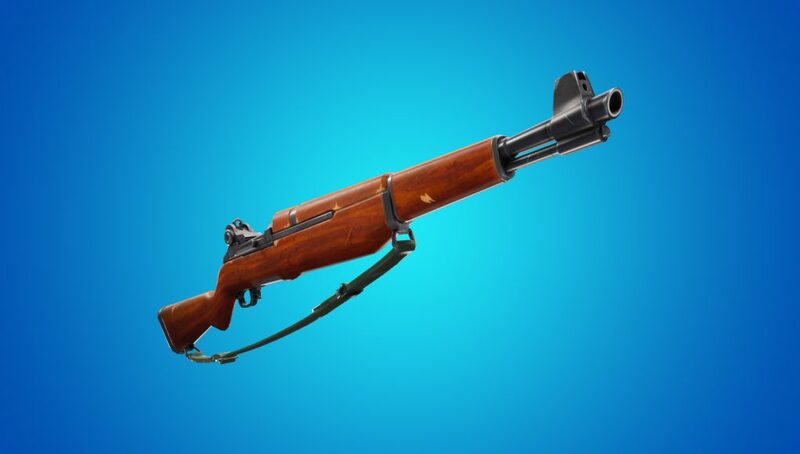 The Infantry Rifle uses medium bullets and is available in Common, Uncommon and Rare variants. It deals 41, 43, 45 damage and can be found from Floor Loot, Chests, and Vending Machines. There is a #ShareTheLove Valentines surprise! 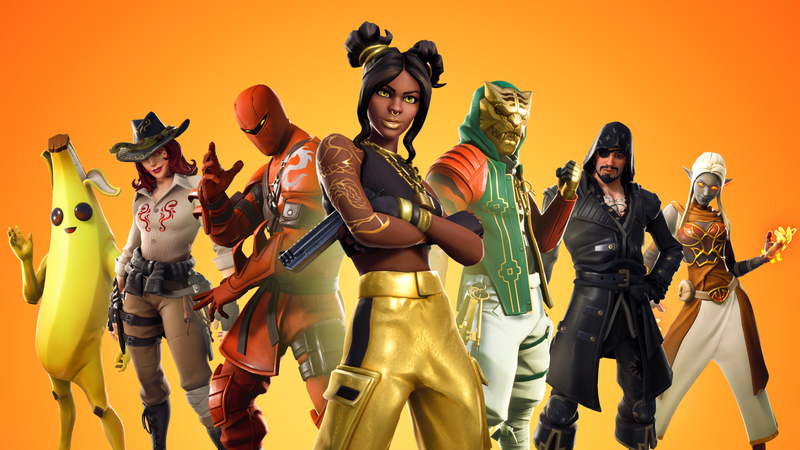 Everyone who completes 13 free Overtime Challenges by February 27 will receive the upcoming Season 8 Battle Pass for free! Remote Explosives, Port-a-Forts, Impulse Grenades, and Shockwave Grenades. Rocket Launchers are now only available from Chests and Supply Drops now. Clingers have been unvaulted and grenades have been vaulted. Pop-Up Cup settings have been added to default playlists. Epic is introducing a few larger changes into the default playlist as a test. These settings in pop-up cups result in more engaging fights and allow players to gain more consistent rewards for the risk of engagement. They have implemented the following: 50 Health (or Shield) based on your health when the Elimination occurs. 50/50/50 materials dropped on Elimination, 500/500/500 Cap on materials, and Harvest rate increased by 40%. You can check out the link below for the full details on the new weapon, #ShareTheLove surprise, new LTM, and more. In the new Fortnite update, they released a new battle pass, Pirate Cannon, New Locations, and more. New Season, new Battle Pass. 100 levels, over 100 new rewards. Damage enemy locations or structures by launching a cannonball or become a special delivery by launching yourself with the new Pirate Cannon. Push the Cannon into position, take aim, and fire! Alternatively, climb into the barrel and launch yourself! It deals100 damage to enemies on a direct hit and 50 damage to enemies within a small radius. Some items have been vaulted in this update. Sneaky Snowman, Chiller Grenade, X-4 Stormwing, Shopping Carts, and All Terrain Karts. Explore new points of interest that emerged with the Volcano, such as Sunny Steps and Lazy Lagoon. Some bugs have been fixed in this update. They've fixed Clingers that would cause damage through walls / floors when stuck to a player. They also fixed items that would occasionally be invisible for some players. You can check out the link below for the full details on the new battle pass, pirate cannon, new locations, and more.